Species notes: Both Swamp Buttercup (the older R. septentrionalis) and Hispid Buttercup have almost the same characteristics except for the amount of long spreading hair on the stems and the preference for location. Most sources such as Flora of North America and the Minnesota plant lists of the DNR and the U of M Herbarium now combine these plants into R. hispidus. 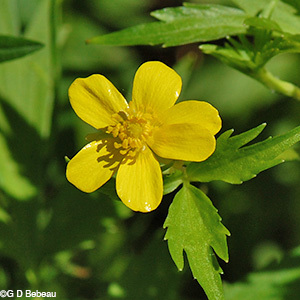 Swamp Buttercup is a native perennial forb growing on stems are 6 inches high and up to 36 inches long, hairy and sprawl as the season progresses. They can then root at the stem nodes. Leaves are both basal and stem with about the same shape. Basal leaves are deeply divided 3-parted dark green leaflets; each leaflet has lobes cut or toothed; the terminal segment of the leaflet is stalked, the laterals are sessile. Basal leaves are the largest, up to 3 inches long plus the stalk. Stem leaves are alternate. Leaves on the flower stem are simpler, sometimes just 3 linear leaflets. The inflorescence consists of solitary flowers, rising from the upper leaf axils, that are very conspicuous over the dark green leaves. The Flowers are up to 1/2 to 1 inch wide, with 5 to 8 yellow petals and normally have 5 lance-shaped, spreading to reflexed sepals that are reflexed 1 mm above base and that have fine hair; the petals are widest above the middle with rounded tips and are either the same length or up to 2x as long as the sepals; stamens are numerous and surround a yellowish-green receptacle of numerous pistils, which lack styles. The base of the petals changes in color to a translucent yellow-green with fine dark green lines that act as nectar guides for the insects. 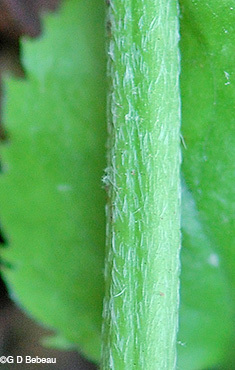 The flower stalk, receptacle and the sepals are hairy. Seed: Fertile receptacles elongate and produce flattened dry achenes with a lance-shaped beak. The margin of the achene forms a narrow rib 0.4-1.2 mm broad. Varieties: There are three currently recognized varieties of R. hispidus - see notes following the photos. Toxic: The plant has hazardous elements - see notes below. Habitat: Buttercups comprise about 275 different species. With it's golden-yellow flowers with shining petals, R. hsipidus grows on the wetland path in the Woodland Garden. A plant of semi-moist areas and rich loamy soils, it needs dappled sunlight in spring during flowering and then the leaves remain over summer in the shade. Roots are fibrous, without tubers. Plant types that were formerly classified as R. septentrionalis are usually found in more moist soil. Names: The generic name Ranunculus, is from two Latin words, 'rana' meaning ' frog' and 'unculus' meaning 'little' and together they refer to a group of plants, many of which grow in moist places - like little frogs. The species, hispidus, means 'with fine hair'. The variety name, nitidus, is from the Latin word niteō, meaning 'to shine'. The family name of Buttercup, used to be "Crowfoot', hence the continuation of the old name in many of the species common names. The author name for the plant classification - “Michx.” is for Andre Michaux (1746-1802), French botanist who made many exploring expeditions in the U.S. collecting and cataloging many species. Two important works of his are the Histoire des chênes de l'Amérique septentrionale (1801 - Oaks of North America), and the Flora Boreali-Americana (2 vols., 1803). His son Francois, traveled with him and the father’s notes were later used for the 3-volume North American Sylva, for which Thomas Nuttall provided some supplements. 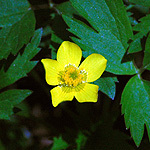 Common Names: Some of the Buttercups have assumed the same common name as others of the genus. R. hispidus is variously listed as Swamp Buttercup, Hispid Buttercup, Bristly Buttercup and Rough Buttercup. Bristly Buttercup is also applied to R. pensylvanicus. Best to stick with the scientific name. Comparisons: Here are a few other buttercups for comparison. 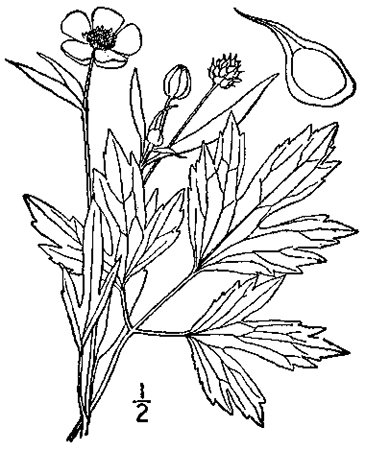 Kidney-leaf Buttercup, R. abortivus; Cursed Crowfoot, R. sceleratus; Tall Buttercup, R. acris; Hooked Crowfoot, R. recurvatus; Bristly Buttercup, R. pensylvanicus. Above: Note that some flowers have more than 5 petals. Drawing from Britton, N.L., and A. Brown. 1913. An illustrated flora of the northern United States, Canada and the British Possessions. 3 vols. Charles Scribner's Sons, New York. Below: 1st photo - Prior to flower maturity - The stamens have yet to extend, surrounding the green carpels in the center. Note the translucent yellow-green bases of the petals which act as nectar guides for insects to reach the nectaries at the bottom of the petals. Below: 1st photo - The spreading sepals with their fine coat of hair. 2nd photo - A 3-parted basal leaf with the deeply divided leaflets. 3rd photo - Stems have fine hair. 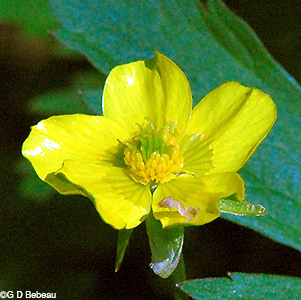 Notes: Eloise Butler first recorded Swamp Buttercup in the Garden when she noted it in bloom on April 2, 1910. She listed an old synonym for this plant of R. septentrionalis. This plant was listed on Martha Crone's 1951 inventory of plants in the Garden at that time and on later census reports. There are two closely related varieties considered native to Minnesota: The species detailed above and Ranunculus hispidus Michx. var. caricetorum is the other. The difference is mainly in the seed and the sepals: var. caricetorum has sepals spreading or reflexed from the base and achene margins 0.1-0.2 mm broad; whereas var. nitidus has sepals reflexed 1 mm just above the base and achenes with margins 0.4-1.2 mm broad. Both of these varieties can root at the stem nodes. The third variety, not found in Minnesota, is var hispidus whose stems are not decumbent and do not root at the nodes. Native populations overlap in a number of Minnesota counties, including Hennepin where the Garden is located. Native to fewer than 30 counties, mainly in the southern half of Minnesota, var. nitidus has less distribution that var. caricetorum. Var. nitidus is native to the eastern half of the U.S., and Manitoba and Ottawa. R. hispidus is one of 16 buttercup species found in Minnesota. Toxicity: Many of the species of Ranunculus are poisonous and will severely irritate the skin. If taken internally the plant can cause stomach inflammation. Cattle can be affected if they eat the plant. When the plant is dried, however, the poisonous material evaporates. Bees have been poisoned when they pick up pollen from Ranunculus species. - see this article on bees - pdf. Legend: The legend of this plant family is this: Ranunculus, a Libyan boy who sang very beautifully, always wore green and gold silk. While singing in the woods, wood nymphs heard him and to get some peace and quiet, they turned him into a green and gold flower. "A number of the early flowering plants are members of the crowfoot family [Ranunculaceae -in current times this family is now called the Buttercup Family], [such] as the anemones and buttercups. In the divided leaves of a crowfoot, as some of the buttercups are called, the early botanists saw a resemblance to a bird’s foot. The buttercups of Minnesota are not so much in evidence as the tall European buttercup [Ranunculus acris L.] the pest of the hay fields - farther east. One early species, Ranunculus abortivus, [Littleleaf Buttercup] has so small a flower that a novice would scarcely notice it, and is surprised to hear it named a buttercup. Neither would a child be likely to apply the time-worn test of holding the flower to your face to learn if you love butter. This lowly buttercup [her text omits the common name] blooms sparsely on the prairie with the pasque flower. 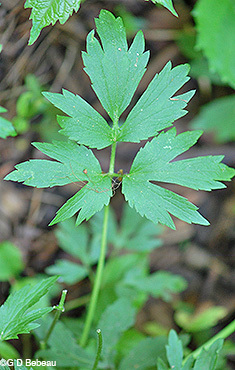 The specific name rhomboideus [prairie buttercup] indicates the shape of the leaf. 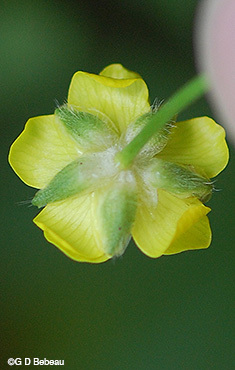 The low, tufted R. fascicularis [early buttercup] has a larger flower, but is not conspicuously massed. Our two prettiest buttercups are aquatics - one with shining, yellow petals; the other with smaller white flowers and long, railing stems; and both bearing finely dissected leaves. The large Crowfoot family is without strongly marked characters. Its plants have usually an acrid taste; the leaves are generally more or less cut or divided; the corolla is often wanting, and, when this is the case, the calyx is colored like a corolla; the stamens are numerous; the pistils vary in number from one to several; and all the parts of the flower are distinct or unconnected."